Back in June of 2012, LinkedIn confirmed that they had been breached, and approximately 6.5 million user’s credentials had been compromised. Now, almost 4 years later that number has grown exponentially. 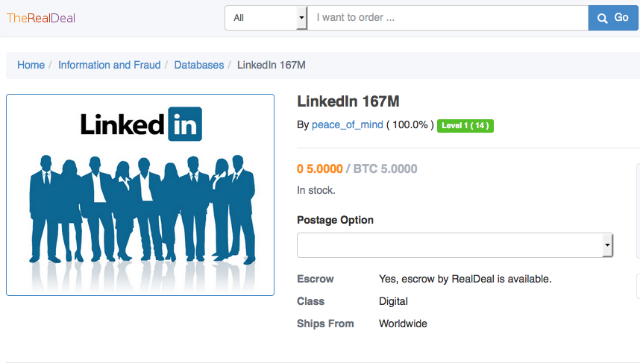 Busy bee hacker “peace_of_mind”, or ‘Peace’ as they seemingly prefer to be referred to as, reported to Motherboard that they are in possession of 167 million LinkedIn database. Of those they have the credentials for 117 million accounts. If you are a LinkedIn member, we highly recommend taking a proactive step by going onto the website and updating your password immediately. If you are also in the habit of using the same password on multiple sites – stop that. Hackers realize that the majority of online users are creatures of habit and will maintain one or a slight variation of a password for more than one account. We know, that’s a lot to remember, but the odd struggle to remember which password goes with which account is a lot easier to manage than identity theft.